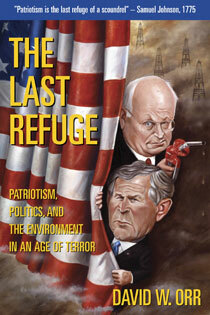 Updated and revised following the 2004 elections, The Last Refuge describes the current state of American politics against the backdrop of mounting ecological and social problems, the corrosive influence of money, the corruption of language, and the misuse of terrorism as a political issue. Setting out an agenda that transcends conventional ideological labels, David Orr contends that partisan wrangling is only a symptom of a deeper dysfunction: The whole political machinery that connects Americans' fundamentally honorable ideals with public policy is broken. The book offers a withering critique of the failings of the Bush administration, supplemented by new essays that look at the national-level dominance of the Republican Party and examine the fallacy that the evangelical right represents a Christian majority. After analyzing the challenges of reforming the current system, Orr offers an empowering vision of a second American Revolution that peaceably achieves sustainability and charts a hopeful course for forward-looking citizens. "David Orr asks us to imagine a world where our politicians are informed, one where we actually care about the kind of earth our children will inherit. He's got to be nuts. Or, just maybe, he's on to something big." Jim Hightower, publisher of "The Hightower Lowdown" and author of "Thieves in High Places"
"A tightly reasoned, excellently written book that should be lethally effective in helping readers who aren't experts understand the contours of the crisis."